Outdoor design, installation, and garden care. Specializing in outdoor structures & xeriscape plants. Portland, OR. Our philosophy regarding outdoor design is centered around solid and thoughtful hardscaping. As much consideration as you would put into an interior remodeling project should be given to your outdoor spaces. 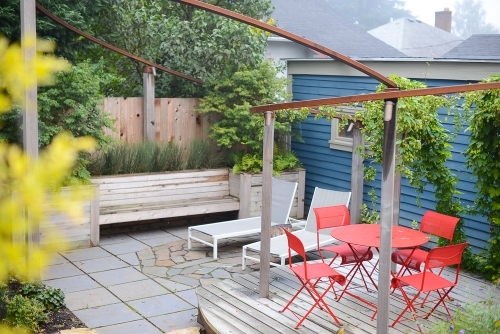 Urban housing is getting tighter and we must start considering our outdoor space as living square footage, especially in a place like Portland that has such amazing summers with lots of sun and forever long days. Coming out of a long, wet winter our lives spill outside and our living space suddenly has the opportunity to open up. More space to Barbecue, dine, and lounge about reading and socializing. Hardscaping is the backbone of any landscape. It is there all year round, and provides the structure for your outdoor living space. Deciding how you will get around your space, and how you want to use it is the first step in installing a landscape. When looking at these things we will consider the materials that will work best, the light, and the basic lay of the land. We like to include raised beds and planters for growing your own food, as well as sculptural patios and decks. We install most of our hardscaping ourselves, and also have a handful of talented craftspeople that we use for specialized projects.